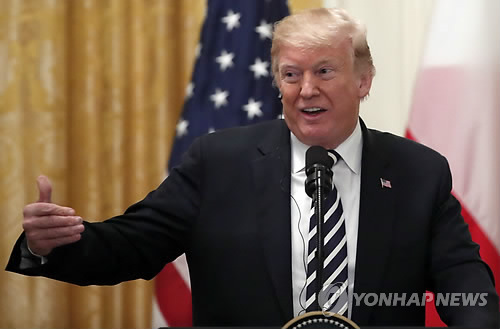 WASHINGTON, Sept. 19 (Yonhap) — U.S. President Donald Trump said Wednesday that there has been “tremendous progress” with North Korea following another summit between the two Koreas’ leaders. Kim committed to take additional steps to dismantle the North’s ballistic missile programs and expressed his willingness to shut down its key nuclear facility if the United States takes reciprocal steps. It wasn’t immediately clear which letter the president was referring to. The White House said early last week that Trump had received a letter from Kim in which the North Korean leader requested a second meeting between the two. Planning for that meeting is already underway, White House press secretary Sarah Sanders said. The North Korean leader committed to work toward “complete denuclearization” of the Korean Peninsula in exchange for security guarantees from the U.S., but progress on the deal stalled as each side demanded the other move first. Moon went into his third summit with Kim amid pressure to broker a breakthrough in the impasse. “Well, we’ll see what he’s looking at. We’ll see. But in the meantime, we’re talking. It’s very calm. He’s calm. I’m calm. So we’ll see what happens. Okay?” Trump said, referring to Kim. Writing on Twitter hours earlier, Trump relayed the outcome of the inter-Korean summit.